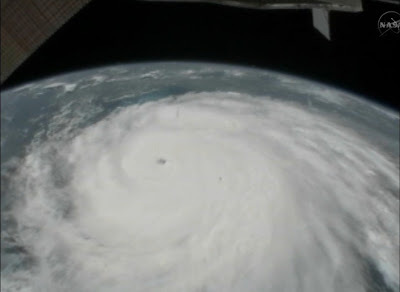 Hurricane Irene from the Space Station this afternoon. 5:30 p.m.: Amtrak has canceled most service south of D.C. for Fri., Sat.and Sun. Most trains on the NE Corridor not yet affected. 5:23 p.m.: Pepco is contacting individual customers who need power for critical medical equipment, urging them to review their emergency plans. 5:09 p.m.: Forecasters at the National Hurricane Center have issued the first warnings for the entire North Carolina coast to the Virginia border. 5:02 p.m.: New York Gov. Andrew Cuomo has declared a state of emergency. 4:33 p.m.: Va. Gov. Bob McDonnell has authorized localities to issue mandatory evacuation orders as they see fit. 4:21 p.m.: Alexandria-area Home Depot says business for sandbags is brisk and supplies may not last. 4 p.m.: New Jersey Gov. Chris Christie: "From a flooding perspective, this could be a hundred-year event." 3:33 p.m.: Va. Gov. Bob McDonnell and Emergency Management officials will hold a press conference at 4:15 p.m.
3:23 p.m.: Ocean City, Md. initiates phase 3 of emergency plan - mandatory evacuations beginning at midnight tonight. 3:19 p.m.: American Airlines and its American Eagle affiliate canceled 126 flights on Thursday. Delta Air Lines reported four cancelations, and United one. 3:10 p.m.: Bill Nye, "The Science Guy," says the storm is so powerful because it's just off shore and thus able to pick up speed and power. 3:02 p.m.: Weather Channel anchor says this has the possibililty to become "the hurricane of our lifetime." 2:52 p.m.: Officials in Accomack County (N.C.) and Sandbridge area of Virginia Beach have issued voluntary evacuation orders. 2:24 p.m.: On MSNBC, Discovery Channel's Atom Edwards warns people in projected path to NOT try to ride it out. 2:13 p.m.: Storm now hitting the Bahamas with a fury. 1:37 p.m.: Maryland Gov. Martin O'Malley has declared a state of emergency in the state of Maryland. 1:07 p.m.: New Jersey governor Chris Christie is declaring a state of emergency because of Hurricane Irene. 12:07 p.m.: White House aides say President Obama spoke Thursday with officials to get updates on the hurricane's progress and ensure that states and local governments have what they need. 11:30 a.m.: The U.S. Navy ordered ships in its biggest East Coast center to head out to safer waters on Thursday to protect them from approaching Hurricane Irene. 11 a.m.: Amtrak announces train cancellations south of Washington D.C.
10:58 a.m.: Virginia Governor Bob McDonnell declares a state of emergency in Virginia. Seems to be bypassing us. Good luck.